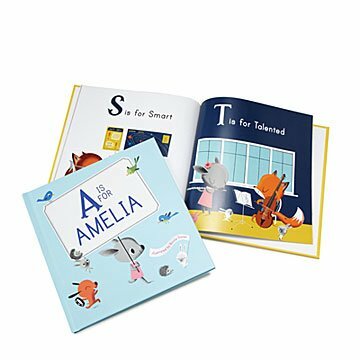 This personalized ABC book is filled with illustrations of positive traits to inspire your little learner. This is a true story. It's a story about that special little boy or girl in your life. It begins with an enchantingly illustrated cover, personalized with that child's name and initial--from A is for Abigail to Z is for Zachary. Inside, the reader is first greeted by a personal message from you, whether words of advice, love, or encouragement. In the pages beyond, you will find an illustrated alphabet, but instead of stock words like "Apple" and "Bicycle" it is filled with positive personality traits. Whether your child is already "Brave", "Imaginative" and "Patient", or whether those are qualities he or she is still learning, you will have an inspiring journey together. Made in Minnesota. Great book, fun for kids to see their name in a book. This will definitely be my goto baby gift for family or friends. Very nice keepsake book. Yes I will buy more. Granddaughter loves that her name is on the cover. I will buy this book again and again!! Cannon is learning to recognize his letters but most importantly there are many great positive lessons to learn. This book builds character! Special gift for a special occasion.